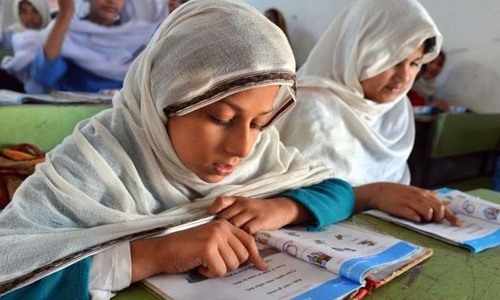 ISLAMABAD: Though the number of out-of-school children has reduced from last year’s figure of 24 million to 22.6 million, statistics of 2015-16 still paint a gloomy picture, calling for the imposition of real education emergency. As many as 44pc children between the ages of five and 16 are still out of school. The statistics further reveal that 21pc primary schools in the country are being run by a single teacher while 14pc have one room. These bitter facts were revealed in the Pakistan Education Statistic 2015-16 launched by the National Education Management Information System (NEMIS) – a subsidiary of the Ministry of Federal Education and Professional Training - on Wednesday. The report says that only 30pc children remain enrolled from class 1 till 10th. As regards to schools’ infrastructure, 40pc public sector primary schools were operating without electricity, 28pc did not have toilets, 25pc were without boundary walls and 29pc had no access to drinking water. While 7pc schools did not have any building and 43pc had unsatisfactory buildings. According to the report, Balochistan was home to the highest proportion of out-of-school children followed by Fata. 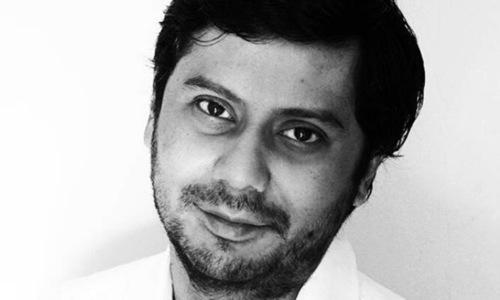 “The situation is pathetic; it has been like this for a long time and is getting worse. The government should prioritise the education sector,” said Dr Khalid Aftab, former vice chancellor of Government College University, Lahore. “I think, the actual figure of out-of-school children is much higher than 22.6 million; how can we rely on this data,” he asked. “Instead of focusing on infrastructural development, such as roads, the government should focus on health and education,” he added. He said the incumbent government was performing relatively well when it came to the uplift of the education sector, but a lot still needed to be done. Earlier, while speaking at the launching ceremony, Minister of State for Federal Education Balighur Rehman said the report noted considerable improvement in the Net Enrolment Rate in Primary Education, availability of physical facilities in government schools and reduction in number of out-of-school children (OOSC). “The number of OOSC in classes 1-12 and the age bracket of 5-16 years has reduced by 3pc per annum from 25.96 million in 2012-13 to 22.64 million in 2015-16. Punjab has outperformed other provinces by managing to reduce the number by 6pc per annum from 12.87 million to 9.92 million during the same period,” the minister said. He said the net enrolment rate in primary education had improved at the rate of 4pc per annum from 14.65 million in 2012-13 to 17.1 million in 2015-16. Again, Punjab had fared better than other provinces, making a contribution of 6pc per annum. The minister also appreciated improvements in physical facilities in government schools and urged provincial governments to concentrate in this area. “After devolution the responsibility for improving quality and accessibility of education has fallen on the provincial and federal governments,” the minister said, adding that these statistics would be taken up at the upcoming Inter-Provincial Education Ministers Conference. The minister further informed the audience that improving the adult literacy rate, initiating accelerated learning programmes for older out-of-school children and encouraging non-formal education were the three focus areas of the government aimed at improving accessibility of education. Pakistan has the lowest literacy rate in south asia. Wow ! The reprt didn't bother to discuss KPK. JUST TO SHOW OFF PUNJAB. How many adults in percentage terms are illiterate ? 22.6m is like 85% of Afghanistan population. THAT'S HUGE! Out-of-school children (UNICEF 2016, est. ): Pakistan-30%, India-21%, Bangladesh-17%. That means a lot more teachers to be employed to educate our younger generation. The actual number of out of school children of primary age in Pakistan is 5.1 million. The figures of 50% in Punjab, 61% in Sindh, 65% in KP and 78% in Balochistan are for pre-primary children ages 3 to 5 years, not for ages 6-16 years. In 6-16 years age group, 7% of urban and 23% of rural children are out of school. After Census it will come down to 5% and after CPEC it will be 0%. Why bother about other countries ? But who cares! Let Nawaz Sharif continue making roads and motorways so he can get keep losing and let Zardari take his 10% in commissions. This figure is pre-primary children age 3 to 5 years...many tend to send their children school after 5 years. So this figure is intrinsically wrong and hypothetical talking about 22.6 million out of school children. It includes a 3 year at home who is suppose to be in school, which is not possible in rural areas. The blind and selfish out of us will keep on voting for, cheering for and defending status quo parties that have ruled this country since 1971....Jiay Bhutto, jiya Nawaz, jiya Altaf....how can we justify our blind "love" for the ruling elite with such statistics? Is is because these are not our children? And those in schools include madrassas, most of which impart no scientific education. The Govt is fixated on outsourcing motorways and orange lines only. Enough is enough, with the exploding population and the illiteracy, I don't see a future for my children here. I am immigrating to Canada. This is the so called progressing Pakistan the PM always talks about. 22.6 million children still out of school, 84% Pakistani people are forced to drink contaminated unhealthy drinking water and even the very basic healthcare facilities are out of the reach of poor people in Pakistan. And that's not all. And PM Nawaz is the PM for the third time. How many are keen on taking up the teaching profession ? Are teachers paid well ? Is there national policy with sanctioned budgetary funds for constructing schools in villages every year ? Is the problem because of Child Labour prevailing in these areas....because a day in school means loss of daily wages. After completion of Schooling are there supplementary skill development schemes to enable them to secure gainful employment or start on own? This will only give encouragement to come to school. In short all this requires holistic approach ! All those who still vote for this incompetent government, therefore have to be the families and relatives of this children. Ignorant, illiterate and easily influenced by empty promises and slogans of a better tomorrow. Well done Nawaz shareef, zardari, Altaf, musharraf and benazir. ( will add imran khan in the list once he finishes his tenure and the number would still be the same). Pakistani Government should incurr on education and health instead of incurring on spying. I like the use of the word "still" out of school. In my opinion, as I see the country's priorities, this number will only grow. Although the ones going to school may have better busses to go to school. And for us , PSL is the most important matter and no one is allowed to say anything against it..
Presenting OOSC statistics is always been tricky. when you present OOSC statistics, you should also present percentage of children attending pre-school. By default, OOSC excludes children who currently attend pre-school. 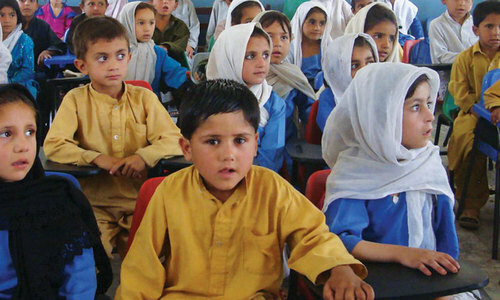 In many rural areas of Pakistan, primary schools are at distance. Parents prefer to admit their children to school when they are physically strong enough to walk to school. For example, many of parents in Kashmir or Gilgit-Baltistan will prefer to send their children to school when they are 6 or older because of the mountainous terrain. which automatically results in a higher percentage of OOSC. My state of Tamil Nadu in South India has a literacy rate of over 90%. By law all children, including girl children must go to school. Everything from food to dress to slippers to laptops to bicycles are provided FREE by the State Government. There has not been a single case of malnutrition in over a decade. The schemes have produced children who are excellent in Math and Science. It could be a model for North Indian states and Pakistan to follow. World's biggest nursery of tomorrow's headaches. Most of these children end up as trouble makers or terrorist. The federal government must work out a policy for the basic education for the young people. I read an article in a magazine, which said EDUCATION IS A TICKET TO PROSPERITY. @Iftikhar Husain your comment is totally illogical. If at all what the federal minister has said and mean it, than, what has the provincial and federal government been doing till date? Health and Education is to be on top priority list and come up for discussion on periodical basis; monthly, quarterly or at the most half yearly. Besides, how, where and when the funds allocated for health and education are being utilized and by whom? After completion of five years of governance, you all will be out to boast about your achievements without touching upon the subjects left aside, ignored and leftover for the following government to bear the burden. Where govt puts tax on higher education and gives subsidy on metro, what can you expect? Their priorities are clear.